The new ALPS FSL liner (FSL) is the perfect application for amputees with poor manual dexterity, and for vascular patients. Minimal socket rotation is achieved by maximizing contact with the socket-wall surface area in a uniform 6mm profile. Maximum comfort is delivered while allowing shear forces on the skin to be redistributed. Unrestricted stretch provides greater elasticity so that the FSL can be rolled on and off as simply as a sock. The absence of a fabric cover allows ALPS GripGEL™ to conform to the residual limb as needed without constricting the proximal end. No special lamination processes needed. See our ad in the May 2009 EDGE for our free gift promotion. Matrix Curve is a low-profile spiral AFO design that is now available from SPS. Its custom-fit composite structure provides infinite patient possibilities. The dynamic, slim, low-profile design is an excellent choice for low- to high-activity-level wearers with unilateral or bilateral drop foot. Custom-fit calf band and footplate. Trulife's Matrix Curve is available in four sizes, from small (foot lengths less than 25cm) to extra-large (foot lengths of 26-31cm), based on the wearer's shoe size. Euro International is proud to introduce the new Rotation Adapter, REF# 10A10/T, by Streifeneder ortho.production. Made of titanium, the Rotation Adapter allows your patients to easily maneuver everyday tasks with more comfort and ease. 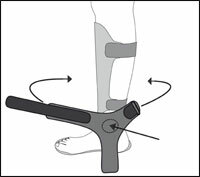 It has a proximal adjustment core and a distal adjustment-core acceptance. It weighs in at just 195g (0.429 lb. ), and the press button activates the rotating mechanism and contains an automatic locking system, which gives patients security. The maximum weight is 125kg (275 lb. ), and it has an effective height of 34mm. 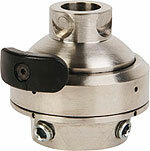 The new BK U-Flates, available through SPS, are sized specifically for transtibial applications. Along with the shorter, 24-in. length comes a smaller price tag. BK U-Flates, from PRS, are priced 42% lower than the list price of a regular U-Flate. Shorter length to accommodate a BK prosthesis. Highly durable skin at a tremendous value. Less waste and better pricing. Call for color swatches if needed. Tamarack and Becker Orthopedic introduce a unique flexure-hinge technology that virtually eliminates the limitations of earlier flexure hinges, allowing practitioners to meet client needs while delivering cosmetic and fabrication benefits. 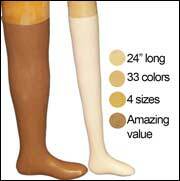 Three sizes provide strength, durability, and ease of fabrication for thermoplastic orthoses. Model 740 Free Motion features self-aligning medial and lateral joint axes for easy installation. The patented high-strength inner core reduces unwanted joint elongation and improves strength. Model 742 Dorsiflexion Assist (shown 742-95) features motion-assist power, typical of traditional metal joints, without the added bulk and weight. The ultimate in versatility, shock absorption, rotation, and stability in one compact package. Dynamic, precision-engineered spring incorporates vertical compression and axial rotation. 365 lb. weight rating, 36-month warranty. Becker now offers the Shoulder Abduction Rotation Orthosis (SARO) in additional sizes and increased adjustability to enhance its clinical application. Since 2002, the SARO has gained wide acceptance in the O&P community and has been used successfully for pre- and post-operative management of the pediatric shoulder joint. Now through April 30, 2009, receive an additional 10 percent off all SPS purchases of the Liner-Liner®. Engineered to be worn under a liner and next to the skin, the Liner-Liner is fabricated of thin, high-stretch material that provides a degree of skin grip while relieving skin shear irritations. Relieves skin-shear irritations and improves comfort with liners. X-Static® silver fibers fight bacteria and odor and transport heat and moisture away from the limb. Washable interface keeps liner cleaner and helps control skin irritation. 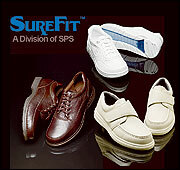 SPS has immediate availability of SureFit's expanded line of diabetic shoes to all O&P customers. Existing SPS customers may order any SureFit shoe directly from SPS customer service as of April 1, 2009. SureFit's diabetic shoe offering extends SPS' high-quality name brands through the addition of New Balance®, Rockport®, Hush Puppies®, and Red Wing®. SureFit has the perfect complement of diabetic shoes to fit even your most discerning patient. Whether your patients want casual wear with supple full-grain leather uppers or stylish shoes to complement a busy lifestyle and modern flair, SureFit has the selection to meet their needs. Ohio Willow Wood designed and tested P-POD™ products specifically for active children. 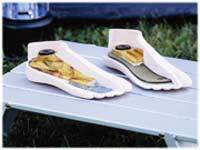 P-POD Feet: For children just starting to walk, the P-POD SACH foot is ideal. As gait develops, the P-POD Impulse Foot, which offers toe response, is appropriate. P-POD Liners: Durable, abrasion-resistant pediatric Alpha® Liners provide protection and comfort. P-POD Foundation: A variety of endoskeletal components provide a solid, dependable base for a prosthesis. Mini G-Lock: For suspension applications, the Mini G-Lock was designed for pediatric amputees. CAD-friendly and easy to fabricate. 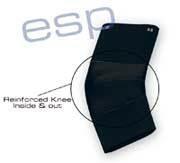 The ESP FlexiSport™ Sleeve is the perfect solution for transtibial standard suction socket applications. The FlexiSport Sleeve is 3/16 in. thick and made from a heavy-duty, latex-free material. Made in the USA quality, at a competitive price. Nylon-reinforced knee inside and out. Perfect for use with ESP Lyn Valve® BK, BK2, or RV Slide. Preflexed to 45 degrees for maximum range of motion. Textured interior for secure grip. 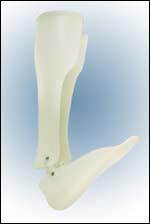 Dycor's new "K Series" K2 Flexible Keel prosthetic foot (L-5972) is ideal for unassisted transfer. 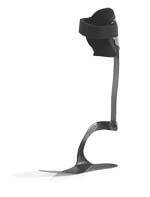 The design is similar to the K1 Flexible "K Series" foot but incorporates a firmer dorsiflexion bumper. 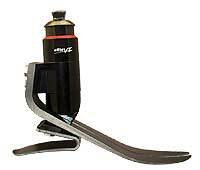 For bilateral transfer, the K2 Flexible Keel prosthetic foot should be used in conjunction with a K2 Energy Storing "K Series" foot (dominant side). The 26 cm foot, including the integrated foot shell, weighs 7 oz. (198g). Weight limit is 99-295 lb., depending on size. Human Intelligence Technology (HI-Tech) is a new company. We're featuring the Jim Smith one-ply filler sock this month. Provel offers cost-effective, fast, easy-to-use, and reliable O&P automation . 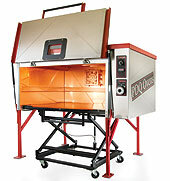 The D2 digitizer, C5 carver, and T6 thermoformer are appropriate for small clinics as well as large central fabs. All are AOP-file compatible and backed by a two-year warranty. The D2 digitizer allows automated shape capture of prosthetic casts with unmatched accuracy. The C5 carver is not only fast and precise, its self-contained dust-collection system is extremely quiet. The T6 thermoformer consistently produces high-quality thermoplastic sockets from industry-standard preforms.